Photo of former Chinese Premier Li Peng and Michael C. H. Jones. Chinese Ambassador to Australia Wu Tao is shown in the background. The function was the special New South Wales State Dinner given by The Honourable Bob Carr MP, Premier of New South Wales, and Mrs Helena Carr, for His Excellency Mr Li Peng, Chairman of the Standing Committee, National People's Congress of the People's Republic of China, and Madame Zhu Lin, held in Sydney, Australia, on Thursday 19th September 2002. As per the following Report the current human rights dialogue between Australia and China was launched in August 1997 by Prime Minister John Howard and then Premier Li Peng. However this resulted from many years of diplomatic friction, when Australia supported US resolutions at Geneva condemning China's human rights record, all of which had an undermining effect on trade and investment relations. I had previously met the Chinese Premier in Canberra during his State visit in late 1988, and had numerous meetings with Australian and Chinese Government leaders, and also Australian Opposition representatives in Canberra during the early and mid 1990s, at which the ACCCI Chief Representative ACT Greg Burns and I raised the issue of how to deal with the human rights issue in a more constructive way. The then Shadow Minister for Trade, Alexander Downer, was very receptive to our ideas and recommendations. The Chamber has always encouraged and supported Chinese signature and endorsement of human rights agreements and particularly the two United Nations Covenants on Political and Civil; and Economic, Social and Cultural Human Rights. These signatures have been very important for trade and investment harmony. Similarly ACCCI has always had confidence that the structure and procedures of the Chinese Government were evolving to meet the demands of membership of the WTO and the global community of nations. The new leadership of an expanded Chinese Communist Party Politbureau - from 7 to 9 - led by General Secretary Hu Jintao, must continue these policies of "opening up" launched in December 1978. Human Rights under the new "social democratic" philosophy of the 'Three Represents' proclaimed by retiring President Jiang Zemin, will inevitable change the nature of the Chinese Communist Party - certainly as leading business figures climb the steps to greater influence and power in future years. So Australia with five years of experience, and projects well advanced, is strategically placed to contribute to human rights developments in China -whether economic, social and cultural or the more contentious political and civil. These human rights developments will help ease the internal domestic strains placed on a society and civilisation under extreme pressures of change from global forces. There will be no peaceful trade and investment relations between China and the world, including Australia, unless General Secretary Hu Jindao and his eight associates on the Chinese Communist Party Politbureau respond resolutely to the human rights challenges of the 1.3 billion Chinese people. Old men can not rule from the grave. China is expected by the global community to take a leadership role in world affairs on all the major issues, and this includes the questions of democracy and human rights. Chamber has watched China since our foundation on 16th September 1976. Foundation Members had involvement with China going back to the first Chinese Consul to Australia, in Melbourne in 1913, after the Revolution which overthrew the Qing Empire in 1912. We have always had confidence that China would emerge to take its rightful place in the world. Future President Hu Jintao now has that responsibility. 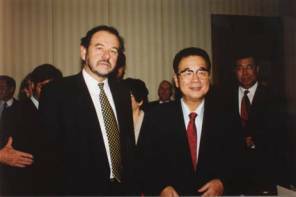 In August 1997, following discussions between Premier Li Peng and Prime Minister John Howard, China and Australia initiated a high level dialogue on human rights. During the course of the initial dialogue it was agreed that the two countries would undertake a program of technical cooperation aimed at strengthening the administration, promotion and protection of human rights in China. Subsequent rounds of the annual human rights dialogue have noted the success of the activities sponsored under the technical cooperation program and endorsed further activities intended to consolidate and extend the achievements of earlier activities. · ethnic and minority rights. Each activity is designed and implemented through a cooperative venture between the Human Rights and Equal Opportunity Commission (HREOC) and a particular Chinese organisation. On the Australian side, the human rights dialogue is managed by the Department of Foreign Affairs and Trade and the Australian contribution to HRTC is provided through the Australian Agency for International Development (AusAID), the Australian Government’s development cooperation agency. AusAID has entered into a Record of Understanding with HREOC to manage the overall implementation of HRTC. HREOC works directly with the Chinese counterpart agencies and with the Australian specialist agencies and individuals that participate in particular activities. On the Chinese side, cooperative relationships leading to the implementation of particular activities have been formed with the Ministry of Foreign Affairs (the lead counterpart organisation), the Supreme People’s Procuratorate, the Supreme People’s Court, the National Judges College, the State Ethnic Affairs Commission, the Ministry of Justice, the Ministry of Public Security, the Chinese Academy of Social Sciences and the All-China Women’s Federation. Consultations with the State Family Planning Commission, the All-China Youth Federation and other agencies have also taken place with a view to their future involvement in the program. A significant trend in the HRTC Program has been the increasing geographical spread of its activities. In the early days, most HRTC activities were concentrated in the capital and surrounding regions. Over time, efforts have been made to spread the benefits of the program more widely, through the implementation of training programs and other activities in provincial locations. HRTC is a concrete manifestation of the commitment of the two Governments to work towards improvements in the administration, promotion and protection of human rights in China. Individual activities focus on practical measures to achieve these ends. The entire program is fundamentally underpinned by the view that by working together and by exchanging views and approaches, the most effective elements of human rights protection, promotion and administration will develop and prosper. Since the initial dialogue the program has grown and developed from general introductory style activities to more closely targeted activities. Some examples of previous activities are described below. In July-October 1999 nine Chinese nationals from the Ministry of Foreign Affairs, State Family Planning Commission, State Ethnic Affairs Commission, Supreme People’s Procuratorate, Ministry of Public Security and the China Law Society spent three months in Australia undertaking a purpose-designed course. The course was conducted directly by HREOC but included visits to and lectures on the role of Australian organisations involved in the promotion, protection and administration of human rights. These included the NSW and Commonwealth Ombudsman, the Human Rights Council, the Aboriginal Justice Advisory Council, the NSW Police Service, the Police Integrity Commission, the Director of Public Prosecutions, the Independent Commission Against Corruption, the Department of Corrective Services, Amnesty International and a number of other relevant organisations. Discussions with NSW and Commonwealth politicians and office bearers and attendance at two relevant international conferences also formed part of the activity. Scholarships for postgraduate studies in human rights related disciplines at Australian universities have been granted to key officials from the Ministry of Foreign Affairs of China. So far two scholarships have been awarded each year, with most of the students undertaking master of laws programs with an emphasis on human rights subjects. HRTC students have attended the University of New South Wales and the University of Melbourne. The objective of this activity is to expand and strengthen the understanding of human rights and the related domestic issues among Chinese officials working in a key government agency directly concerned with human rights issues. In 1999 the former Chief Justice of Australia, Sir Anthony Mason, together with a serving judge from the Federal Court of Australia Justice Finkelstein, delivered lectures at the National Judges College in Beijing. The lectures encompassed a number of subjects, most notably judicial review and the rules of criminal procedure. Sir Anthony Mason and Federal Court Justice Matthews returned to the NJC for further lectures in July 2000. In June 2000 five judges from the Supreme People’s Court of China and a number of provincial courts undertook a ten day study visit to Australia to examine forensic practices and procedural rules to protect human rights in Australian courts. In October 2001 the Chief Justice of New South Wales, James Spigelman, together with Federal Court of Australia Justice Catherine Branson, Victorian Supreme Court Justice Murray Kellam and former High Court Justice Sir Daryl Dawson, conducted training at the National Judges’ College in Beijing. The focus of the training was on judicial ethics and covered issues such as judicial independence, conflict of interests, judicial impartiality and bias. This activity coincided with the introduction of China’s first Code of Judicial Ethics and the training provided some initial guidance on the application of its provisions. Judicial cooperation under the HRTC Program has moved from a standard lecture format introducing broad themes to a more practical training format focusing on specific topics relevant to the protection of human rights in the context of judicial practices. In September 1999 a two-day seminar held in Beijing brought together a number of Australians prominent in human rights promotion and protection and Chinese nationals with similar responsibilities. Participants, who included NGOs, academics, officials and social commentators, discussed the concept of civil society and the role of government and non-government organisations in the development and implementation of social policy. On the Chinese side participating organisations included the China National Committee on Aging, the All China Youth Federation, the China Disabled Persons Federation, the All-China Women’s Federation, the Chinese Academy of Social Sciences and the Ministry of Foreign Affairs. The Chinese Academy of Social Sciences (CASS) has translated into Chinese a series of key western books and articles on freedom of expression and mass communication law. This activity may be complemented by a seminar held in Beijing to exchange views on freedom of expression and its impact on mass communication. The seminar would be intended to discuss the role of government regulation, the judiciary and independent journalism. The longer term goal of the whole activity is to assist CASS to develop recommendations and draft legislation incorporating freedoms into mass communication law. In September 1999 an introductory seminar on the reporting requirements of the International Covenant on Civil and Political Rights (ICCPR) and the International Covenant on Social, Economic and Cultural Rights (ICESCR) was conducted in China by officers of the Attorney-General’s Department and the Department of Foreign Affairs and Trade. In May 2000, officers from both departments, together with HREOC, provided training in Australia for key Chinese officials who would be responsible (in the event of their ratification) for reporting under the ICCPR and the ICESCR. The longer term goal of these two initial activities was to provide encouragement for China to ratify and fully implement the two covenants. China signed the ICESCR in October 1997 and ratified it in February 2001. The treaty came into effect in China in July 2001. The first report on implementation of the provisions of the treaty will be due in July 2003. These developments provided impetus for a further reporting seminar focusing specifically on the ICESCR, held in Beijing in July 2002. The seminar was conducted in partnership with the Chinese Ministry of Foreign Affairs which has overall responsibility for reporting under the treaty. The Chinese participants comprised approximately 30 officials from government agencies relevant to the reporting process. As with the previous reporting activities, the Australian presenters were from the Attorney-General’s Department, the Department of Foreign Affairs and Trade and HREOC. Presentations addressed various steps in the reporting process including information gathering, report preparation and report presentation and discussion before the Commission on Human Rights. This activity was more tightly focused than either of the previous activities in that it dealt exclusively with the ICESCR and involved Chinese officials who will carry actual responsibility for preparing China’s first report. The objective of this activity was to strengthen the capacity of Chinese organisations to prepare China’s initial report under the ICESCR. This activity will contribute to the goal of HRTC by providing officials with a good understanding of the reporting requirements of the ICESCR, particularly in relation to China’s capacity to promote and protect the rights guaranteed by the Covenant. This two part activity involved a visit by officials of the All-China Women’s Federation to Australia (Jan 2000) to plan, together with relevant Australian organisations, a subsequent workshop held in Shandong Province (Feb 2000). The workshop helped develop practical measures by which provincial organisations can ensure that women receive the full protection of the law. The Australian organisations involved in the activity included the Women’s Legal Resources Centre, the Domestic Violence Advocacy Service, the Public Interest Advocacy Centre, the Waverley Domestic Violence Court Assistance Service and the Wirringa Baiya Aboriginal Women’s Legal Centre, as well as the NSW Department of Community Services and the NSW Police Service. Officials from the All-China Women’s Federation and the local women’s organisation in Xining, Qinghai Province, visited Australia in November 2000 to examine strategies for addressing family violence faced by minority women. This activity built on and extended the outcomes of the Women’s Legal Training Workshop (above). This activity included planning a subsequent workshop which was held in Xining in May 2001. That workshop was conducted in partnership with the All-China Women’s Federation and the Qinghai Provincial Women’s Federation. The Xining workshop in May 2001 was attended by 49 Chinese participants from a range of local organisations relevant to the issue of family violence. Presentations were given by both Chinese and Australian experts, the latter comprising a senior magistrate from Penrith Local Court in NSW and representatives of the Domestic Violence Advocacy Service of NSW, the NSW Women’s Refuge Resource Centre and the NSW Police Service. The main outcome of the workshop was a proposal for the establishment of a local policy on family violence. In addition, the Deputy Governor of Qinghai Provice announced that as a follow-up activity from this workshop the provincial Government would launch a new Campaign on Violence Against Women. A further workshop on family violence was held in Xining in July 2002. The workshop involved presentations by Chinese and Australian experts as well as informal discussions, in both plenary and in smaller groups. The Australian presenters included a Senior Magistrate from the Family Violence Court in South Australia, a Domestic Violence Liaison Officer from the Victorian Police Service, the Coordinator of the Domestic Violence Advocacy Service of NSW and the Coordinator of the Central Violence Intervention Program of South Australia. The workshop was be attended by approximately 60 Chinese participants working in relevant areas including courts, police, local government and community organizations. This workshop built on the achievements of the 2001 Xining Workshop by developing practical strategies and proposals to implement the local policy on family violence. · study of relevant international best practice in information gathering and development and use of advocacy materials. The longer-term objective of these activities is to strengthen the capacity of the All-China Women’s Federation to deliver effective and culturally specific assistance through provincial level operatives to minority women experiencing domestic violence. In April 2002 a Workshop on Trafficking of Women and Children was held in Guiyang in Guizhou Province. This activity was part of a larger anti-trafficking project based in the provinces of Guizhou and Sichuan. The project is being conducted in partnership with the All-China Women’s Federation and the Women’s Federations of the two provinces. The objective of this activity was to enhance the capacity of the ACWF and local women’s groups in two provinces to combat trafficking in women and children. This activity will contribute to the goal of HRTC by improving the capacity to promote and protect the rights of women and children subject to trafficking. The Guiyang workshop examined the causes of trafficking, identified various manifestations of the problem and considered a variety of strategies for combating trafficking in both provinces. Recognising the diverse range of authorities that are affected by trafficking in women and children, the 60 Chinese participants included officials from a wide range of agencies in each province. This included representatives of the local level Public Security Bureau (PSB), Department of Labor and various academics. This helped ensure a holistic cross-portfolio discussion of key issues. Cooperation in this area has been with the National Legal Aid Centre in the Ministry of Justice, which has responsibility for coordinating the provision of legal aid services nationally in China. This cooperation has involved a number of stages which may culminate in a pilot program in China for the delivery of legal assistance to the poor. The first stage was a mission to Hubei Province in May 2001 by representatives of the Kingsford Legal Centre of the University of New South Wales, to examine the conditions and circumstances of legal aid services in that province. The second stage was a visit to Australia by legal aid officials from Hubei Province as well as the National Legal Aid Centre in August 2001 to examine Australian models for provision of legal aid services. That visit was coordinated by the Kingsford Legal Centre and included meetings with the NSW legal Aid Commission, the Federal Attorney General’s Department, private legal firms and a wide range of specialist and generalist community based legal centres. During that visit, there was also discussion of a possible future pilot program on legal aid, based in China and drawing upon both Chinese and Australian expertise. In April-May 2000 twelve officials from the Ministry of Justice (which is responsible for prison administration) visited Australia to study methods by which the protection of human rights can co-exist with correctional regimes. The activity introduced the officials to a variety of practical measures to support the protection of the rights of prisoners, with particular attention to the protection of the rights of juveniles and women. Subsequent activities in the areas of corrections have been directed to the design and implementation of more focused training, undertaken in partnership with China’s Central Educational Institute of Prison Police Officers, the Ministry of Justice’s training institute for correctional officers. In March 2002 seven representatives of the Ministry of Justice and the Central Educational Institute of Prison Police Officers undertook a two-week visit to Australia to design a training program for delivery in China. During that visit they spent one week at the Corrective Services Academy of the NSW Department of Corrective Services, the organisation responsible for training of prison officers in New South Wales. The week included formal presentations and visits to correctional facilities. The other week of their visit was spent with other relevant agencies including the Department of Juvenile Justice. Using these observations, they also engaged in the planning and design of the training program to be delivered to correctional officers in China. That training program was subsequently held in May 2002 at the Central Educational Institute of Prison Police Officers, in Baoding City, Hebei Province. Training was delivered to 219 officers comprising both undergraduates (68) and postgraduates (151). The Australian team consisted of trainers from the NSW Corrective Services Academy. Topics covered in the Australian presentations included the systems for training and professional development of correctional officers, disciplinary procedures for inmates, education and work programs in prisons and other programs to assist prisoner rehabilitation. Presentations demonstrated the system of “case management” which includes development of case plans to address in a holistic way the individual needs and requirements of prisoners. This work has been undertaken in cooperation with the Supreme People’s Procuratorate, the highest prosecutorial agency in China, with wide powers in relation to arrest, investigation and other areas of criminal procedure. A seminar on Human Rights Protection in Criminal Procedure was held in Zhengzhou, Henan Province in June 2000. The primary objective of that seminar was to provide the Supreme People’s Procuratorate with a broad knowledge of rule of evidence and criminal procedure, combined with a practical understanding of how these rules and procedures can operate to protect the human rights of persons accused of crime. The activity was also designed to assist work towards developing codified rules of evidence for use in the Chinese judicial system. It involved presentations by Australian experts with practical experience in these areas, including the NSW Director of public Prosecutions and a Justice of the Supreme Court of Victoria. Subsequent to the above activity, officials of the Supreme People’s Procuratorate visited Australia in April 2001 to examine Australian law and practices in key areas of criminal justice procedure. During this visit, they also identified three priority areas for further training and commenced the design of training workshops in those areas. The three areas identified were i) Rules of Evidence; ii) Preparation and Presentation of the Prosecution Case; and iii) Juvenile Justice. The first in this series of workshops was held in Chengde, Hebei Province in August 2001. This workshop dealt with rules of evidence and built on the earlier workshop in Zhengzhou (above) with a more detailed and focused examination of specific evidentiary rules and procedures. The Australian presenters included representatives of the Office of the NSW Director of Public Prosecution and the Victorian Bar. The second in the series of workshops was held in Chengdu, Sichuan Province in June 2002. The Chinese participants comprised approximately 100 procurators representing the prosecution services of eight provinces, three autonomous regions and two municipalities. The Australian presenters were from the Office of the NSW Director of Public Prosecutions. The workshop addressed a variety of issues central to protection of human rights in the preparation and presentation of the prosecution case. Topics included the role and responsibilities of the prosecutor; the discretion to prosecute; summary and committal proceedings, disclosure of evidence and case management. Cooperation in this area has been with the Ministry of Public Security, the agency responsible for police services. Within the Ministry, the focus has been on the Department of Discipline and Supervision, which is responsible for the maintenance of ethical standards on the part of police. Six officials from the Ministry of Public Security visited Australia in December 2001 to examine structures and procedures for ensuring that police officers maintain appropriate ethical standards when carrying out their duties and are fully accountable for their actions. While the bulk of the program was devoted to sessions with the Australian Federal Police, there was also involvement by the New South Wales Police Service, the Commonwealth Ombudsman, the New South Wales Ombudsman and the Police Integrity Commission. The visit was also used to design a workshop on police ethics and accountability, which was held in Shenyang in Liaoning Province in May 2001. The workshop involved 30 Chinese police participants from a variety of provinces plus 60 other observers. The Australian experts comprised representatives of the Australian Federal Police. The workshop examined the issue of police ethics and accountability from a human rights perspective and examined both Australian and Chinese models for the supervision of police conduct. The longer term objective of these activities is to strengthen the capacity of the Ministry of Public Security to maintain ethical standards and accountability in the performance of its functions. · each activity incorporates objectives on two levels: immediate, albeit modest, impact and longer term change.